This talk will take a comparative and international approach to two themes. The first is the notion that supernatural powers will aid specific actors and the other is that deaths should be commemorated via objects. Building on work that Paul Cohen and others have done in the past, as well as on my own immersion in documents such as letters, poems and newspaper articles, I will draw attention to unexpected parallels between the Boxers and their opponents relating to ideas about invincibility, while also looking at some ways that comparisons between the Boxers and participants in the Ghost Dance Rising have been or could be used to put both groups into perspective. I will also, as part of an effort to get beyond the idea that the Boxer Crisis is seen one way in China and another in an undifferentiated “West,” look at the variation across different parts of the West and over time relating to monuments that commemorate those who died at the hands of the Boxers and Qing troops in 1900. 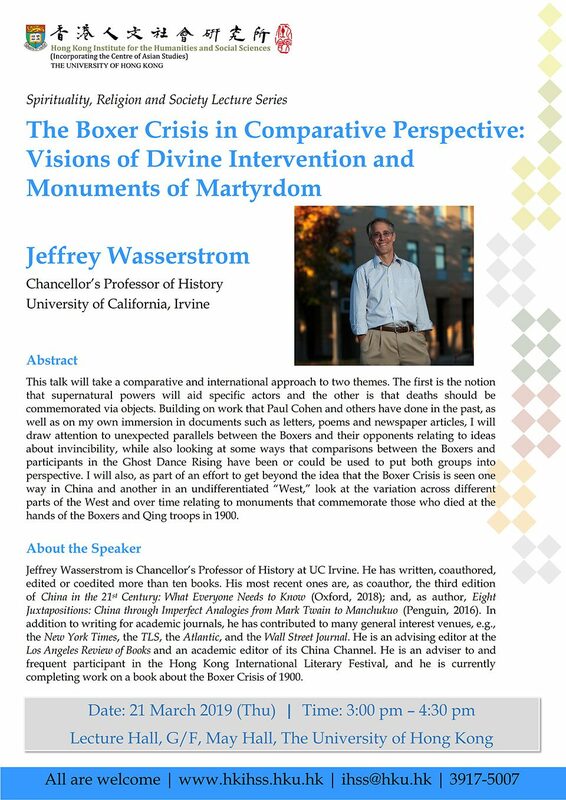 Jeffrey Wasserstrom is Chancellor’s Professor of History at UC Irvine. He has written, coauthored, edited or coedited more than ten books. His most recent ones are, as coauthor, the third edition of China in the 21st Century: What Everyone Needs to Know (Oxford, 2018); and, as author, Eight Juxtapositions: China through Imperfect Analogies from Mark Twain to Manchukuo (Penguin, 2016). In addition to writing for academic journals, he has contributed to many general interest venues, e.g., the New York Times, the TLS, the Atlantic, and the Wall Street Journal. He is an advising editor at the Los Angeles Review of Books and an academic editor of its China Channel. He is an adviser to and frequent participant in the Hong Kong International Literary Festival, and he is currently completing work on a book about the Boxer Crisis of 1900. This is an event organized by the “Rethinking Spirituality and Religion in Asia” Cluster. Copyright © 2019 Hong Kong Institute for the Humanities and Social Sciences, The University of Hong Kong. All Rights Reserved.